We don’t usually travel this much, but we have just returned from another trip. The latest was a shorter and easier trip. 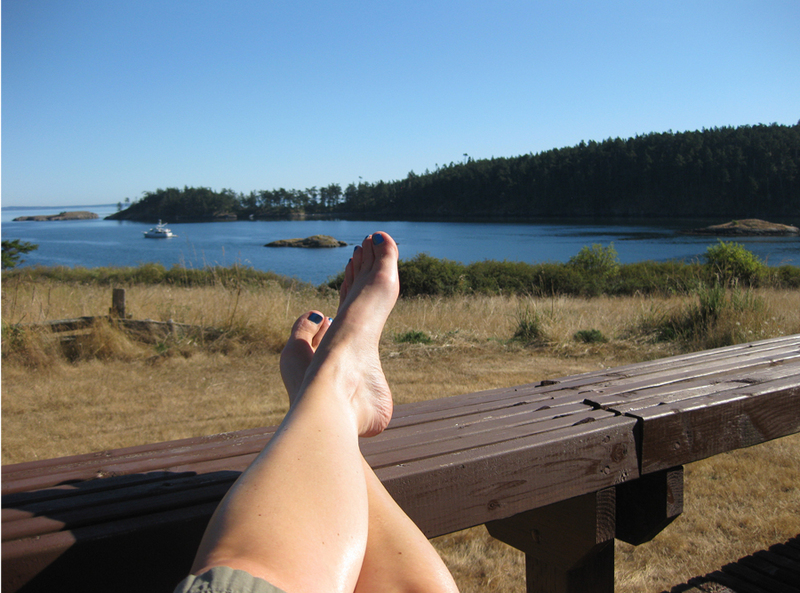 Steve’s summer office party was on Lopez Island last Saturday. Lopez is a 90 minute drive and a one hour ferry ride from home. Since we were traveling all that way for the party, we decided to make a weekend out of it. We left the house Friday morning and arrived on Lopez by lunch time. We wandered around the shops at Lopez Village for a while (I had brought my cane but didn’t use it) and then checked into our B&B on the south end of the island. They had a great deck facing the water where we spent a couple hours relaxing. We went out to dinner and then hooked up with some other work friends also on the island that night and hung out at their rental house for the evening. I typically only see Steve’s co-workers at work functions every couple of months. There was a silent auction benefitting a food pantry when I was still on one crutch. That was the last time I had the opportunity to see these folks. During the evening I got lots of questions about the surgery and recovery. The next day was the party, which consisted of two parts. Part one was an outdoor gathering on a large farm including a light lunch at noon and dinner of grilled salmon later. The second part included tours of two homes designed at the office (super cool, but that’s not what this blog is about). The timing of the party was decided so that it could be done in one day. Many took the ferry over that morning and took another ferry back that evening. Lopez is known for 2 things, being the “friendly island,” everyone you passed waved, and being very bike friendly. Quite a few co-workers left their cars at the ferry terminal and rode bikes onto the ferry and then to the party. So far, my story has been all good. So here’s the little bit of bad. At Steve’s office, he’s known as the bike guy. Since Lopez is the bike-friendly island, everyone assumed Steve would ride there. He did bring his bike and rode in the morning before the party, so he did arrived at the party on his bike. When he was riding, I took the car to explore some sights on the south end of the island. I went to a couple parks. They both had hiking trails but no distances or difficulty ratings were listed. I didn’t want to get into anything too challenging for my hip since i was alone, so I wasn’t able to do too much. It wasn’t really that much fun for me. It reminded me of what I’m still not able to do. Later at the party, I can’t tell you how many people asked us if we rode bikes there. At this point, I don’t look like I’m still recovering, especially if I don’t use my cane. I can understand why so many people asked the bike guy about riding. It was kind of disheartening to tell person after person that I’m not supposed to ride hills or more than 45 minutes. It was a repeating reminder that I still have a lot of work to do. I told this story to my friend Sarah over Skype the other day. I was scolded (with love), complete with finger wagging, and told to give myself some grace. She’s so right! Despite the bike comments, the party was fun. Steve works with a great group of people. I got many comments from people who knew about the surgery about how good I looked. That’s always nice to hear. One guy had seen me laid up in the hospital bed at week 3. I believe I got a, “hey, look at you!” from him. I have come a long way in a relatively short time period considering what I’ve been through. (I know I’m contradicting myself, but one minute I am reminded of my accomplishments and he next my shortfallings.) By the end of the day, after touring the two office projects and a lot of standing around at the party, I was pretty tired. I got to the point where I had to sit down. That was another reminder of the work I still have to do. Changing focus, I saw PT Dan on Thursday. I wanted to address the tightness I’d been experiencing in the first hip since about 6 months post-op. Because of the distance to the office, I’ve only been having appointments every 2 weeks. At my last appointment, which was initially scheduled with Dan, I had been switched to his assistant Katie. Normally that would have been fine. I like Katie. She’s perfectly capable of showing me the next round of exercises. But I had wanted to talk to Dan about #1. I was a bit annoyed they had switched my therapist without letting me know. I made sure I would be seeing Dan this time. So at the appointment, he started by doing a full assessment of both sides. This involves measuring range of motion for every direction you can possibly bend your hips. I measured within normal ranges or just below normal for everything. The other test is strength, which is measured by me pushing against Dan’s hand in every direction you can possibly move your hip, knees and feet. I still have some weakness in my left quad but other than that I’m doing well. I noticed while Dan was measuring my ROM he had some big smiles as he was recording the numbers. After completing the strength tests he said other than the quad weakness I was basically normal. He said I was doing “damn good” especially considering the extent to which my insides were relocated. That made me smile too. If it wasn’t for the issues on #1 he said he would be confident to send me on my way to manage the strengthening on my own. He knows me well enough to know I’ll do the work necessary. But I am still having some issues. On #2 I started having classic bursitis pains above the trochanter (the bump you feel on the outside of your hip). I had this on #1 in the spring but it was below the trochanter. I confirmed with Dan that we have bursa in the location I was having the pain. He agreed with my self diagnosis. The way you can tell if you have bursitis and not a ligament or tendon issue…if you press on the bursa sack it hurts in a very small area. The main issue I wanted to talk to Dan about was the tightness in #1. My hope was that the source was soft tissue and not joint. Joint issues = surgery. I’m so done with surgery. Dan had me do various different stretches to see what angered the problem area. Some stretches engaged just the joint, so if those movements produced pain the issue was coming from the joint. None of these movements produced pain. Other stretches engaged the muscles, so if these produced pain the issue would be coming from the soft tissue. These movements did cause pain. Good news. All indications are that my issues are not coming from the joint. Going forward I have completely different and many fewer exercises. I am doing one exercise, a step up on the stairs, to strengthen my left leg. On the right leg Dan wants me to strengthen the back of my leg and stretch the front. This should show improvements in about 3 weeks. Dan thinks I have a band of scar tissue running across and binding against the muscles in my inner thigh/groin. Every time I engage those muscles I feel that tightness because there’s actually something there. The stretch should gradually break down the scar tissue. I’m very encouraged. I found you on the Yahoo Hipchick page; I just joined tonight. I’m quite a bit older than you (56 , but feel 19 – except for my hips); was born with bi-lateral dysplasia which was treated from birth until I was 4. I will tell you, that until I found the FB Hip group, purchased the hip dysplasia book and now found the Yahoo group, I knew very little, and none of it from any doctors, of which now I have none. I have had a tough year and am now considering hip replacement (I was told 5 years ago I needed it), but don’t have a Dr. and am looking. I live in Idaho, there is not a Dr. here that I would consider. Your Dr. was suggested by someone, not sure how insurance works with Dr.’s who don’t participate – don’t know how to work the system, but I will only consider surgery by the BEST! Good luck finding the right surgeon. You’re right to search until you find the best. I feel very fortunate that Dr. Mayo is only an hour away from my home. He has many patients who fly in from other states. For me, insurance wasn’t a problem because the type of Group Health plan I have allows in-network and out-of-network doctors, hospitals, etc, at pretty much the same cost to me. So, I can see whomever I want. I know this is not the case for most insurance. I think Dr. Mayo is fantastic. His staff is very caring, but things can slip through the cracks with them. I’m not sure if Mayo does replacements. Everyone I know who’s been treated by him has had PAOs or similar procedures. Another place to look might be Dr. Christopher Peters in Salt Lake. Again, I don’t know if he does replacements. There’s also some well-respected doctors in so-cal. Hi, I was just diagnosed with acetabular dysplasia. Can you send me a link to the Facebook group?